I have spent many years using art materials. In the 1970’s I started to specialise in clay. I really like the combining of surface design and function when I create my decorative pots. The same enthusiasm for colourful surface images is even more present in the more expressive art pieces. The abstract nature of marks are derived from land forms and geographical references are always present - rivers, clouds, rain, wind, rocks, and volcanic activity. In my art work I enjoy the feeling of being unrestricted by traditional concepts. By keeping the form simple and basic I can really 'let go' on the surfaces, drawing and painting with ceramic and other materials. I enjoy the ever expanding discovery that is possible when basic glazing "rules' are set aside and imagery is allowed to flourish." 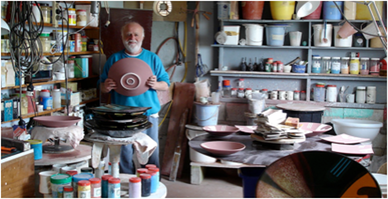 I use modern, technical methods with assistance from commercially prepared clays, minerals and special coloured pigments in the creation of my decorative bowls. I work in themes and series with images that change and evolve from month to month and no two pots are the same. The larger sculptural pieces are basically ceramic but often employ mix medium surfaces and more complex methods. Glazes have a final firing up to 1260°C. this makes the ceramics very strong and durable.